The immediate thing I noticed while reading Catching Fire was that the general quality of Collins' writing seemed to greatly improve. 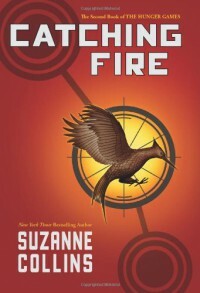 It still has a blunt, simple quality to it - which works well in tandem with Katniss' personality - but things seemed more easy to visualize, and were a little more detailed. Saying that though, at times I found scenes could be just a tad too dragged out, where I was getting impatient and wanting it to quicken a little. Another slight peeve is how there were a handful of descriptive words that were just overused a little - I got tired of reading 'scream' all the time, instead of perhaps shriek or wail or cry. The biggest improvement is how the characters portray themselves. They show so much more emotion, and Collins was not afraid of showing off and addressing each flaw they had. This particular point was a little lackluster in the first book, so it was a welcome change. Overall, although I did enjoy the first book, I enjoyed this one more. I still don't consider them to be gripping page-turners, but they're a good read nonetheless.